A working investor builds a portfolio with an eye toward growth, security and income, and along the way acquires a diversified collection of assets in the form of investment products and services. When that working investor retires, he often divests his portfolio of products he no longer needs, and which no longer serve the financial purposes of his life. In creating its new study on portfolios of affluent investors – Asset Allocation, Portfolios and Perception of Providers - Spectrem determined the difference in the structure and distribution of investable assets in the investments of working and retired investors. The jumping off point is a look at the comparable investable assets percentage among total assets. 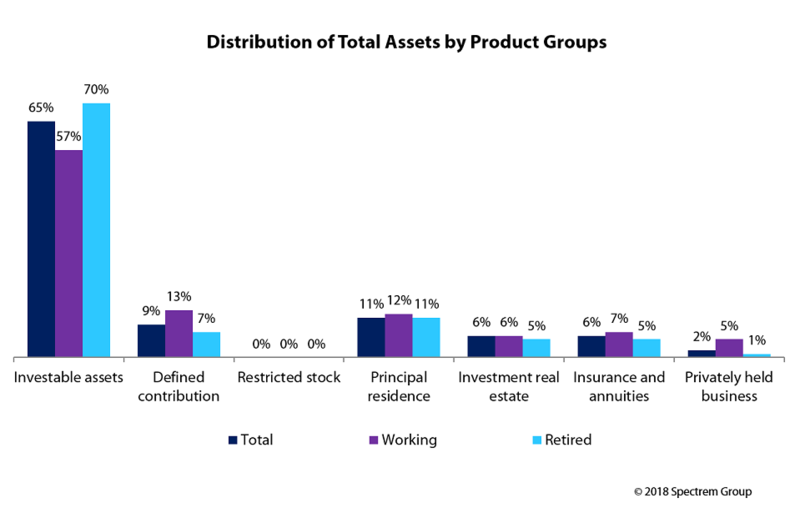 For all affluent working investors, investable assets is 57 percent of their total assets, but for retired investors, investable assets top out at 70 percent on average. The differences lie in several categories, but working investors have more money assigned to defined contribution, privately held business and insurance and annuities then do retired investors. There are not wide disparities between how the investable assets of working and retired investors are spent, although 30 percent of a retired investor’s investable assets go to rollover or contributory IRAs to only 22 percent of working investors. Those who work have more of their investable assets paced in managed accounts or deposit accounts, but not by a great percentage margin. Privately held businesses do, however, provide a significant disparity in ownership between working investors and retired ones. This is key for advisors to understand in dealing with investors who own their own business or are heavily invested in the operation of a business. Their investment needs will change dramatically if they divest themselves of that business or pass it along to others. It is sensible that retired investors would have a different take on short-term investments than working investors. After all, the term “short-term’’ probably means different things to those two types of investors. Nineteen percent of working investors own Treasury bills to just 13 percent of retired investors, and similarly 14 percent of working investors own Treasury Inflation Protected Securities (TIPS) to just 9 percent of retired investors. Working investors are slightly more likely to be invested in equities, although they are much more involved in restricted stocks and stock options than retired investors. Working investors also have much more involvement in alternatives, especially venture capital and hedge fund investments. The point of comparing the portfolios of working investors to retired investors is to see how a retired investor’s portfolio is simplified and clarified. Working investors are more likely to spray to all fields, whereas retired investors are much more focused in what they are trying to accomplish. Advisors need to prepare a working investor for all of the changes that will occur once they retire, and the best ways to make the most of their investments in retirement as opposed to what they were accomplishing while working.